The Connected Educator Month is around the corner. Norway, Australia, New Zealand and the USA have organized hundreds of events for educators to learn, connect and collaborate. As I am preparing to be part of a panel on October 2, 4 pm (USA EST)/October 3rd, 9am (NZ time) and keynote in Oslo, Norway on October 21st, I am looking at 4 big ideas around the connected educator through the lens of connected professional learning. I think about the isolation of a teacher within their classroom walls and how connectedness to a global network of experts and peers could expose and add multiple perspectives to their world view and professional practice. I am amazed every time by the transformative nature of teaching and learning, when harnessing the power of a network to crowdsource authentic data, resources, connections and collaborators. Last, but not least, the idea of being able to model for our students what connected learning in an interconnected world means is a moral imperative for educators who are charged to prepare our kids for their future. Interesting, that when thinking about being connected, my first thoughts turn to the opposite, of being isolated as a teacher. How to break out of the loneliness one can feel as a learner, reflective practitioner and someone looking for feedback when spending most of one’s work day inside a classroom with the doors closed. Traditionally, teaching has been and is one of the most isolating professions. Isolated in a physical classroom. Isolated as the only Spanish teacher in the entire school building. Isolated as the only member on a non existing grade level team. Isolated by being surrounded with children the entire day without speaking to another adult. Isolated when only hearing oneself speak when lecturing to a roomful of students, class period after class period, repeating the same lecture over and over again. How can teachers open up the walls of their classroom and become connected to experience and gain perspectives from other educators around the world? Being connected to other educators and experts gives teachers, for the first time the exposure of multiple perspectives and constant opportunities to access different points of view. Opportunities to learn from newbies and experts. Once connections are established, trust has been given and received, the network machine has started to function. It is the moment when sending a “shout-out” into your network is not just met with silence. A shout-out is met with a response, an answer, a re-tweet, a comment, feedback, a push back, added value, etc. This goes far beyond traditional face to face network connections though. Traditionally one expected the response from a few people. Crowdsourcing though”is the process of obtaining needed services, ideas, or content by soliciting contributions from a large group of people, and especially from an online community”. The response could easily be co-created by fifty, hundreds or even thousands of people contributing. Part of network literacy is the understanding of and harnessing this type of network intelligence. As David Weinberger in his book “Too Big to Know” stated “The smartest person in the room is the room”. It is the exponential potential that makes being a connected educator transformational. The Moral Imperative to Model Network Literacy and Learning for our Students in an Interconnected World. Obtain a basic understanding of network technology. I strongly believe that if we want globally connected students, we need to have globally connected teachers. Students need teachers who model connected learning and not just talk about it. Students need teachers who have experienced connected learning in order to translate and tweak that experience into their classrooms. Students need connected teachers, who can connect them with an authentic global audience, peers and experts. Students need teachers to model building an academic learning network. Students need teachers who are adept in applying global pedagogy (approaches, strategies and techniques to facilitate learning) to their curriculum. 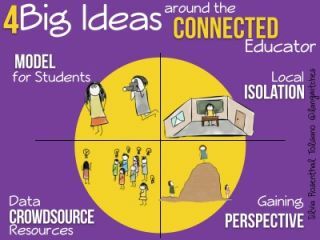 When you think of connected educators, what are your big ideas that surface? Connect your thoughts, come out of your isolation, share your perspective, add to a crowdsourced collection of global pedagogy examples and how you model connected learning for your students. Much is made of the opportunities that digital technologies offers both educators and students in terms of opening up possibilities for collaboration and learner-centred design. We must also keep our eyes open to the challenges and ask the big questions about why we design learning as we do. This session will debate the issues, gains and challenges for learning in a digital work. With special guests, Audrey Watters (@audreywatters/Hack Education), Silvia Tolisano (@langwitches/), Tom Barratt (@tombarrett/NoTosh) and Togi Lemanu (@TogiLemanu/CORE Education), hosted by Karen Melhuish Spencer (@virtuallykaren) and Phoebe Davies (@rukuwai). With the increasingly interconnected nature of our global society and the need for a very different kind of literacy for our students, extending teaching and learning beyond the walls of our classrooms is especially vital in this digital age. If you want globally connected students, you need globally connected teachers who are capable of communicating, collaborating and connecting to experts and peers from around the world. These educators are harnessing the power of global connections for their own learning in order to bring the world to their students. What does collaboration, communication and connections mean in a connected world? What are the steps in becoming a globally connected educator? How do we move from being consumers to producers and contributors? How do we modernize and globalize our classroom practices while expanding our professional learning network to include colleagues from around the world? Silvia Tolisano is a Curriculum21 faculty member, author of the book Digital Storytelling Tools for Educators and founder of the Around the World with 80 Schools project. Read more at http://langwitches.org/blog.